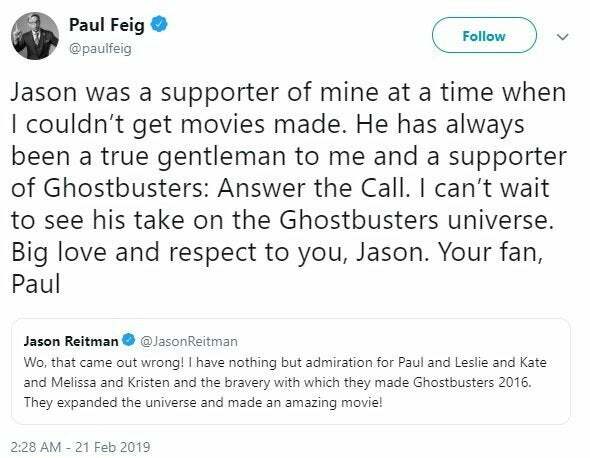 Director Jason Reitman made comments earlier this week about the Ghostbusters community which didn't sit well with some fans, causing the director of the 2016 reboot Paul Feig to defend Reitman's support of the film. Feig shared, "Jason was a supporter of mine at a time when I couldn’t get movies made. He has always been a true gentleman to me and a supporter of Ghostbusters: Answer the Call. I can’t wait to see his take on the Ghostbusters universe. Big love and respect to you, Jason. Your fan, Paul." The announcement that Reitman would be directing a new film set in the universe of the first two films excited most Ghostbusters fans, though the news also confirmed that the events of the 2016 reboot would be ignored. In the weeks since that announcement, Reitman has made comments reminding fans that he was aiming to tap into what made the original film a success. The filmmaker's comments about making a movie for "fellow Ghostbusters fans" in conjunction with the plan to ignore the 2016 reboot immediately disappointed fans of that film, as the implication is that true fans didn't enjoy that movie. Reitman continued that train of thought by noting his film would "hand the movie back to the fans." On social media, fans were not only disappointed by Reitman's dismissal of the 2016 and his comments that demonstrate his gatekeeping of the franchise, but they also expressed how it was the "fans" who engaged in sexist harassment campaigns towards the 2016 reboot and the overall toxic reception of the project. Reitman later acknowledged how his words hurt large groups of fans, leading him to apologize and clarify his remarks on social media. "Wo, that came out wrong!" Reitman shared on Twitter. "I have nothing but admiration for Paul and Leslie and Kate and Melissa and Kristen and the bravery with which they made Ghostbusters 2016. They expanded the universe and made an amazing movie!" The new Ghostbusters will land in theaters on July 10, 2020. Are you glad to see Feig support Reitman? Let us know in the comments below or hit up @TheWolfman on Twitter to talk all things horror and Star Wars! In this latest episode, we talk about the first reactions to Captain Marvel, mourning the loss of Marvel shows on Netflix, the return of Wolverine & so much more! Make sure to subscribe now and never miss an episode!